I have recently been given this pine shohin, unfortunately the person who gave it to me didn't know what species it is, can anyone tell me what it is? Also it looks like its been a year or two since it has been trimmed, should i do this now, in the spring, or maybe a different time? From your picture, I count the needles growing as pairs. A 2-Needle Pine. It looks to be a relatively young tree, so it's hard to be certain, but it could be a Mugo Pine, Pinus mugo, a Japanese Black Pine Pinus thunbergii, or a Scotch (or Scots) Pine, Pinus sylvestris. The Scotch/Scots Pine has naturally smaller growing needles, and those pine needles look pretty short on your tree. But, if forced to choose, I would say it looks a lot like a young Mugo Pine. As far as trimming goes? I remove unwanted new growth that has hardened off at this time of the year, pluck old needles and wire for shape. I save hard pruning of major branches for late winter. The tree is still basically dormant and doesn't bleed out sap so badly then, but it is also getting closer to the growing season at that time of year, so the wound can start healing faster. A timing issue, that works if you, well.... have the time to follow and do it. Otherwise, it's best to work on your trees when you have time and you are ready to do these necessary things, if free time to do these sorts of things is limited for you. Hrrrmmmm... Does that make any sense? Looks like a scots pine to me, though I'm no expert. Decent start to a shohin. Adamsbonsai.com - check in the articles or publications section. Julian Adams' advice can be trusted. Even though the weather is different in UK and USA the basic techniques are the same. Maybe you shouldn't prune this young plant too much but balancing the energy may be done. 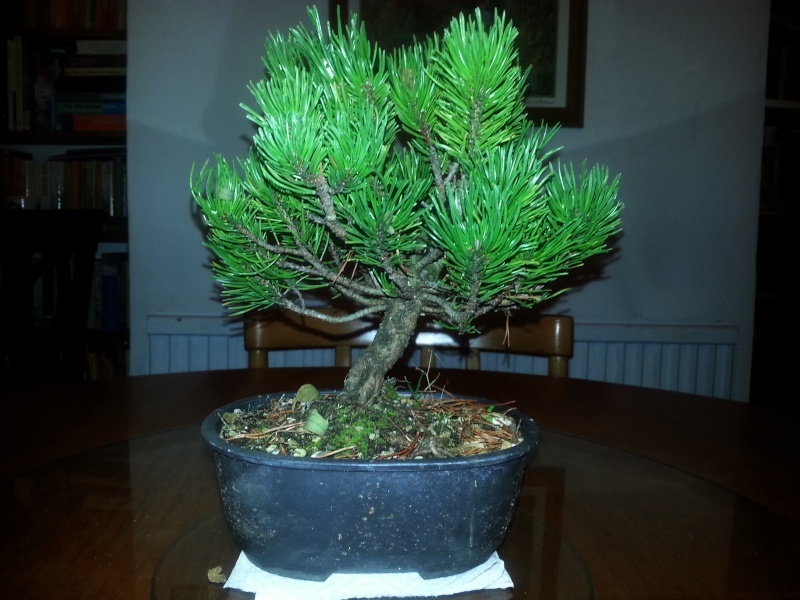 There are a couple of good bonsai clubs in Kent if you dont already know. They'd soon set you right in an identification which is always better done at first hand. Once you have that vital identification, I'd get some tips from Harry Harrington's Bonsai4me website. Definately a Mugo Pine. I grow both Mugos and Scots Pines and this is not Scots though I understand they are close cousins. You need to start eliminating branches and excess growth if you want to continue with a Shohin Mugo. One of My Mugos that I reduced and started working into a Shohin size last year. This tree is about eight inches tall. That's the nice thing about Mugos, they make very nice Shohin because of their ability to maintain small needles size.